This salad is da BOMB. And yes, you CAN eat salads for breakfast! I encourage you to do so. The combination of probiotics, prebiotics and antioxidants in this recipe make it an excellent choice for gut health and an immune boost. The plain Greek yogurt adds wonderful tartness and PROBIOTICS. The Manuka honey adds a touch of sweetness and antioxidants (it also has antiviral properties). 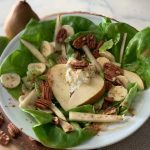 The pear, banana, and butter leaf lettuce add fiber (think PREBIOTICS) and other wonderful nutrients. The squeeze of lime will add some Vitamin C and other antioxidants. Add nuts of your choice for additional protein and fatty acids. Sprinkle some Ceylon cinnamon on top for additional antioxidants. Enjoy!! This recipe is about as quick and simple as they come! No tips today. For a non-dairy version, choose a plain, coconut milk yogurt or other non-dairy yogurt. Be sure to choose a yogurt with little to no added sugar. For those needing to limit sugar and/or carbohydrate intake, leave out the Manuka honey and swap the banana for berries. Note that a slightly green banana will have less sugar and more fiber than a ripe banana. Switch up the fruits and nuts as you desire! Berries would be another great fruit option. Add a few small slices of leftover roasted chicken for extra protein. *Gluten-free, dairy-free (if you use a nut milk yogurt), grain-free. 2 oz pecans or other nut of choice! 1 large pear organic is preferred, pears are one of the dirty dozen! Peel and cut pear into small chunks. Place banana slices, pear chunks into small bowl and mix with juice from lime and cinnamon. 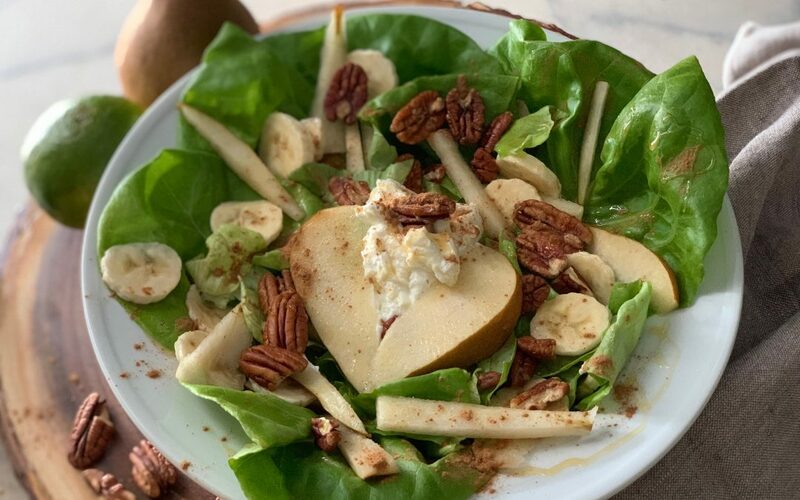 Place pear and banana mixture over a bed of torn butter leaf lettuce leaves. Top with nuts and a dollop of yogurt. Drizzle Manuka honey over salad.